Frog Song Organics and the pleasures of CSA. 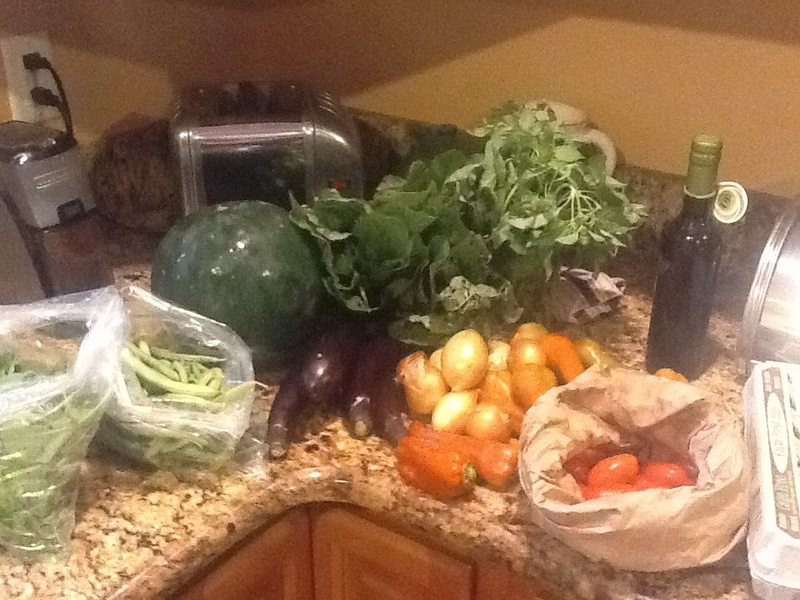 Green beans, watermelon, amaranth, lemon basil, Chinese eggplant, onions, and sweet peppers. We just signed up for Frog Song Organics Community Supported Agriculture (CSA) weekly pick box for the summer. Frog Song is located in Hawthorne, FL, up near Gainesville. So not exactly local, local. But they have started coming to the Winter Park Farmers’ Market on Saturday so we can pick up there and, as John says, the climate and soil in Gainesville is so much better for vegetables than down here, even though it is only a couple of hours away. They supplied a great first box; watermelon, amaranth, lemon basil, green beans, grape tomatoes, Chinese eggplant, sweet peppers, and onions. This blog is going to be all about what we cooked with the CSA each week, augmented by stuff from the garden and from the rest of the farmers’ market. I hope you stick around the the next post to see what we did first. Unless otherwise noted you can assume the dishes are prepared for two people; me and my lovely, hungry, and discriminating partner Bethany.